Barbara Villasenor and Bear lead off the annual Relay For Life's Bark for Life walk, with many other humans and dogs following. A little drink of water for Saradon, Miya and Herbie as the Bark for Life walkers return to the Tehachapi Depot during the 2017 walk. 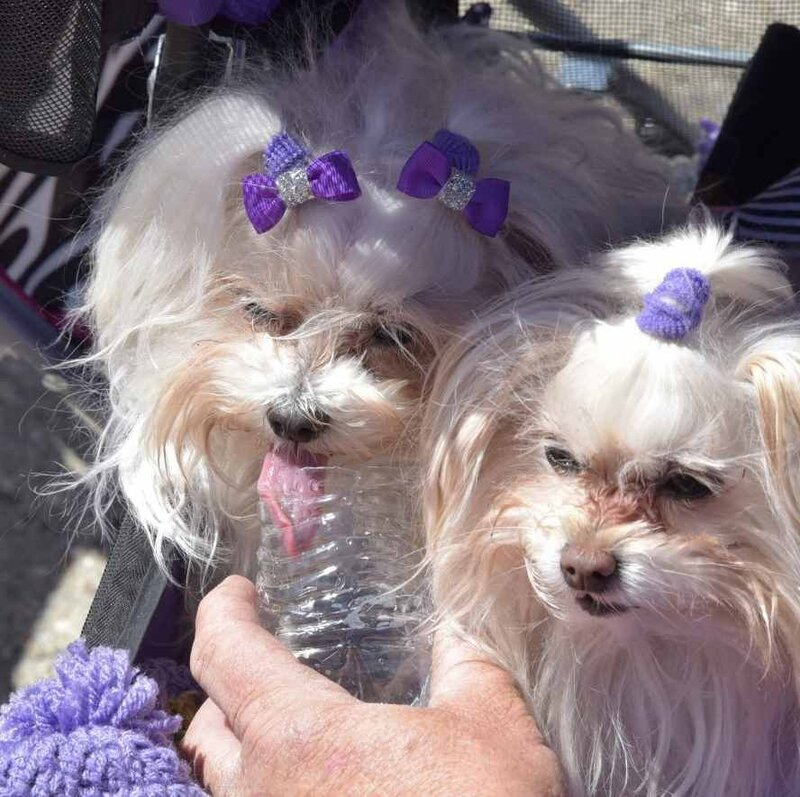 Barb Villasenor, who founded the local event 11 years ago, invites the public to dress up their dogs, and themselves, in the traditional purple and bring them to the Train Depot Museum, located at the corner of Tehachapi Boulevard and Green Street that Saturday. Registration begins at 9 a.m., followed by the walk at 10 a.m.
"This is a great event to celebrate our love for animals," said Villasenor, who lost her dog Keesha to stomach cancer. "That's why I started Bark For Life since at the Relay For Life, you're not allowed to have your dogs there." According to Villasenor, the first Bark For Life event had approximately 25 four-legged participants; however, each year she sees bigger and bigger numbers. Bark For Life is an American Cancer Society event for our canine caregivers or canine companions. Both humans and animals come together for a couple of hours to celebrate cancer survivors, to honor those who lost their lives to cancer and to fundraise in support of the American Cancer Society's mission of eliminating cancer through research, education, advocacy and service. 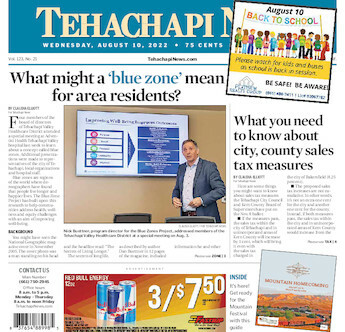 "I truly believe that all this research is necessary to help both humans and animals, so I relay for my dog and my dad who also passed away from cancer in 2009," said Villasenor. The sponsor again this year will be Canine Creek, which will supply free goodie bags to the first 100 dogs to register. All dogs must be on a leash. Cost is $15 for pre-registered dogs, or $20 the day of the event. Registration forms are available at Canine Creek Pet Wash & Boutique, 798 Tucker Road #5; Glamour Salon, 20406 Brian Way #1A; Rescued Treasures, 1121 W. Valley Blvd. ; Billingsley Veterinary Clinic, 21834 Ferncuko St.; on Facebook or at relayforlife.org/tehachapi. The event will include fun raffles and a Relay store. Said Villasenor, "This is a great little event, and we invite everyone to come down and be a part of it. For more information, call Barbara Villasenor at 332-4975 or email her at Barbvillasenor@hotmail.com.